There are 8 Assisted Living Facilities in the Placerville area, with 5 in Placerville and 3 nearby. The average cost of assisted living in Placerville is $4,672 per month. This is higher than the national median of $3,346. Cheaper nearby regions include Cameron Park with an average starting cost of $3,545. To help you with your search, browse the 84 reviews below for assisted living facilities in Placerville. On average, consumers rate assisted living in Placerville 4.7 out of 5 stars. Better rated regions include Granite Bay with an average rating of 4.8 out of 5 stars. Caring.com has helped thousands of families find high-quality senior care. To speak with one of our Family Advisors about assisted living options and costs in Placerville, call (855) 863-8283. The origins of Placerville reach back to the Gold Rush when the city was called Hangtown. Seniors interested in history may enjoy exploring the many Placerville sites that are California Historical Landmarks, including the western terminus of the Pony Express. Seniors in need of help with daily tasks will find Placerville has five assisted living facilities and there are 11 more in nearby communities like El Dorado and Camino. 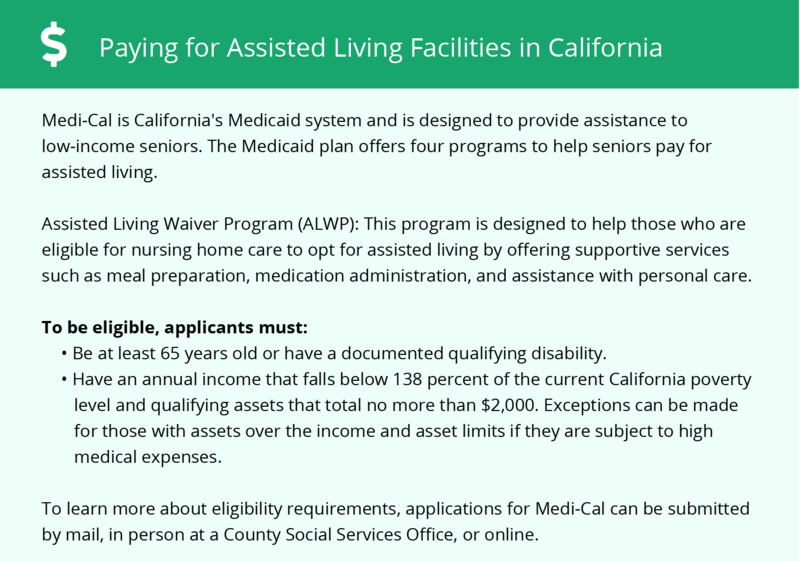 These are known as Residential Care Facilities for the Elderly (RCFEs), and are administered by California's Department of Social Services, Senior Care Licensing Program. The weather in Placerville is comfortable throughout the year. The January low averages 36 degrees, and the July high is around 92. The city averages only one inch of snow each year, and gets 244 days of sunshine, making it a great destination for seniors who like to spend time outdoors. The Placerville area is home to world-class medical facilities, including Marshall Medical Center, in the event of medical emergencies or illness. Transport in Placerville is provided by El Dorado Transit. Seniors are eligible for a discount of up to 50 percent, and may also be eligible for flexible curb-to-curb services, including Dial-A-Ride and ADA Paratransit. The cost of living in Placerville is 43 percent higher than the U.S. average. Housing prices have the greatest impact on this high cost of living, so the price of essentials is not as high as that number suggests. Groceries are only 4 percent higher than the national average, and healthcare is actually 13 percent lower than the U.S. average. Placerville's crime rate is quite high and it is less safe than 87 percent of California's towns and cities. The violent crime rate is 2.53 per 1,000 residents, slightly lower than the Californian average of 4.45. However, property crime occurs at a rate of 35.48 per 1,000 residents, significantly higher than the state average of 25.53. Seniors who receive income from a pension or retirement fund are subject to income tax in California. This can have a large impact on funds available for assisted living. Social security retirement benefits are tax exempt, but seniors will still need to pay sales tax, which is among the highest in the nation. Assisted Living costs in Placerville start around $4,672 per month on average, while the nationwide average cost of assisted living is $4,000 per month, according to the latest figures from Genworth’s Cost of Care Survey. It’s important to note that assisted living rates in Placerville and the surrounding suburbs can vary widely based on factors such as location, the level of care needed, apartment size and the types of amenities offered at each community. 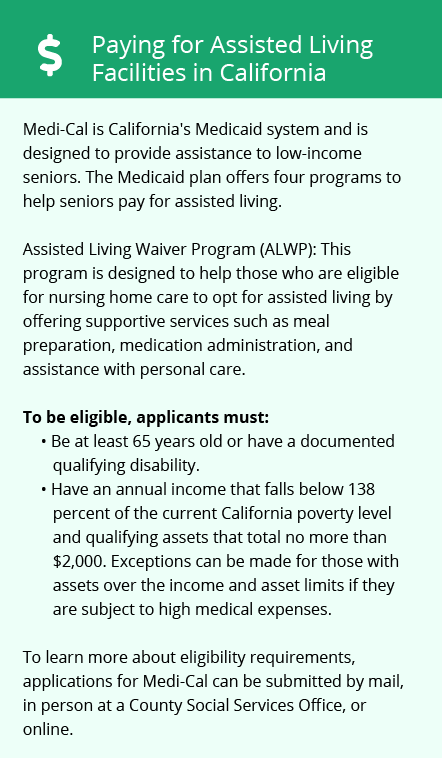 California's Assisted Living Waiver (ALW) is not available to people living in Placerville, but the Optional State Supplement (OSS) may be available to seniors who receive income from Social Security. Placerville and the surrounding area are home to numerous government agencies and non-profit organizations offering help for seniors searching for or currently residing in an assisted living community. These organizations can also provide assistance in a number of other eldercare services such as geriatric care management, elder law advice, estate planning, finding home care and health and wellness programs. To see a list of free assisted living resources in Placerville, please visit our Assisted Living in California page. Placerville-area assisted living communities must adhere to the comprehensive set of state laws and regulations that all assisted living communities in California are required to follow. Visit our Assisted Living in California page for more information about these laws.